A new threat arises that might be able to destroy Batman. 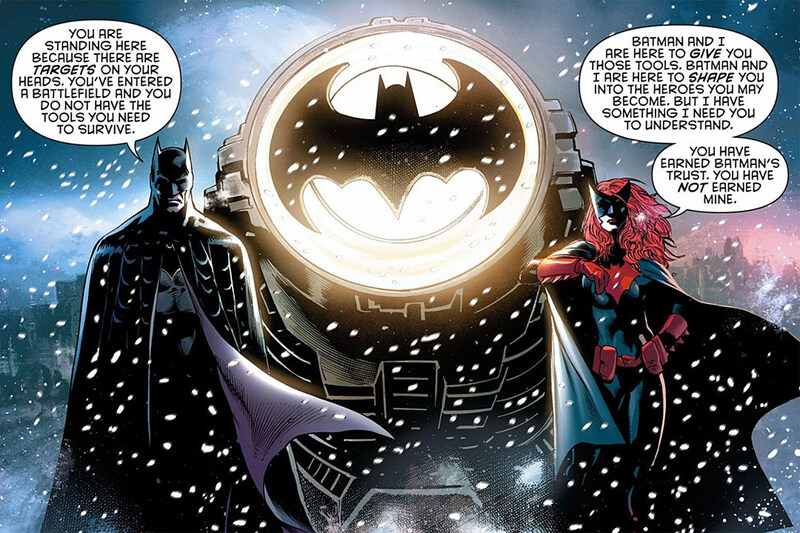 Batman finds Batwoman and asks her for help to form a team. The team consists of different members such as Red Robin, Spoiler (Stephanie Brown), Orphan (Cassandra Cain) and Clayface. That’s right, Clayface will be part of this new team. He is also the character who manages to steal all the scenes he is in. Thanks to him I was able to laugh at loud a lot. Tim Drake has a different suit which is nice and has an interesting realtionship with Spoiler. Orphan will seem to be the most badass character of this series. “More than Batman?” yes, more than Batman because this is at the moment a team comic that will focus more on Batwoman and the recruits as Batman is already developed. Speaking of Batwoman she always seemed like an awesome character and I can’t wait to see how her and Batman lead this new team. The bad guy reveal of this issue interested me, but it was nothing new. In fact, a lot of the issue felt like it was done before in some way or form. The ‘building a team to prepare for a huge threat coming’ story plot point. One complaint would be, how does Batman know he needs a team on this one? What makes this situation so different from other ones to make him wanna create a team? Eddy Barrows has amazing art in this issue and hopefully it can stay on track as the series moves on to twice a month schedule. Overall great characters with a good set-up for the entire series mixed with some stuff done before. The art stands out and is the definite push on buying the comic if you’re really hesitant. I recommend this comic because it’s fun and feels like the fun train will continue.